We were at the deli in Newtonville.. Sat with Jeanette Scandale n Dennis Smith n cried in shock. 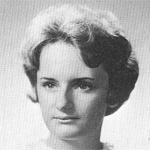 Susan Halewood Crosby added a comment on her Profile. Susan Halewood Crosby added a comment on Thomas Grieve's Profile. Susan Halewood Crosby updated her profile. View. Susan Halewood Crosby has a birthday today. Susan Halewood Crosby has a birthday today. New comment added. Susan Halewood Crosby changed her "Now" picture. Hello from New Port Richey Fl. We survived Irma and nearly back to normal here. There is still difficulty getting fuel and some areas are still flooded. Fortunately, our classmates in this area are all safe and sound. Thank you Roger for your caring words. Prayers and good vibes sure helped so many of us. Rich and I are venturing north this week in a new Minnie RV. Keep the good thoughts going as we hear more daily about Jose on our way to New England to visit our family. Our 50th anniversary onboard Viking cruise Amsterdam to Bucharest Romania. Hi from New Port Richey Fl. Rich and I are hosting a get together cookout April 12th 2017 at our home 3-7pm and hope you can join us. RSVP lordchumley@ gmail .com for address n address. Hi from Newport Richey Fl. Rich and I are hosting a cookout April 12, 2017 at our home for 64' and other NHS classmates. RSVP for address n directions to lordchumley@gmail.com. Happy Birthday Nancy!! Hope u have a special day n the invitation is still active to come to Fl n visit. There are 57 former Newton HS grads of the class of 64 in Florida! Contact either Wes and Betsey Turner or me to join us Feb 13 at 1pm at Kelleys in Dunedin Fl for an informal get together of classmates. Thank you all for birthday wishes. Wwe travel in our 45 ft Tifin Zephyr 7 mos per year.